We couldn’t leave Chicago without trying one of Rick Bayless’ restaurants. His first restaurant, Frontera Grill opened back in 1987, followed by Toplobampo in 1991 and the fast-casual Xoco in 2009. 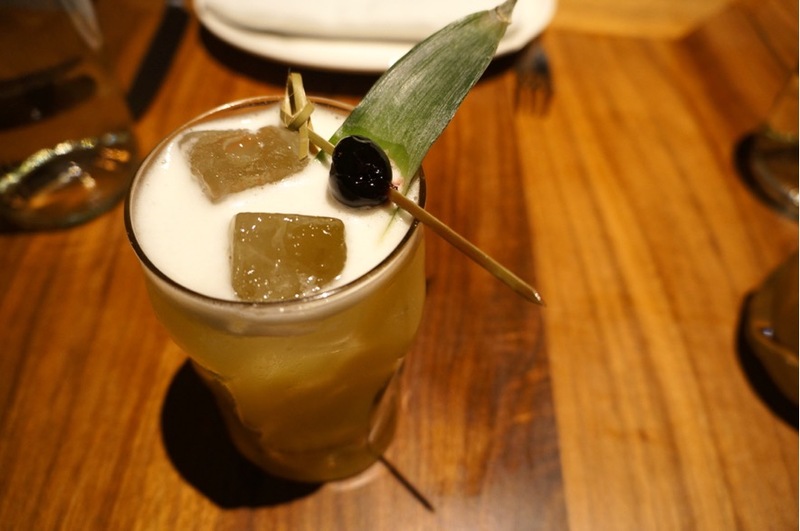 Rather than going to one of these established restaurants, we decided to try his newest spot, the Baja California-inspired Leña Brava. 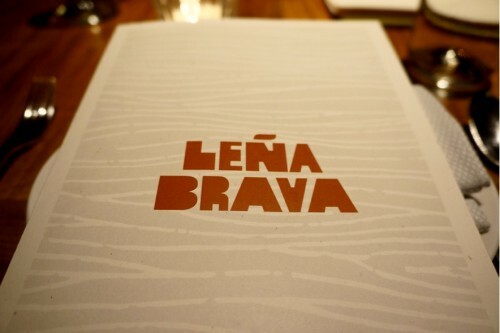 Leña Brava is open six days a week for dinner (closed Mondays) and is located in West Loop, where all the other hot restaurants in town are located. The restaurant occupies a two-story space with the main dining room on the first floor with a quieter and more intimate second floor dining space. Baja California is the Mexican state just south of the California border and is known for their live-fire cooking and seafood. All the food here is cooked in their wood burning oven. I’ve read that they don’t even have a gas line or stoves. The menu is divided into “Ice” and “Fire”. The “Ice” section of the menu consists of raw seafood, ceviches, seafood cocktails, salads and aguachiles. 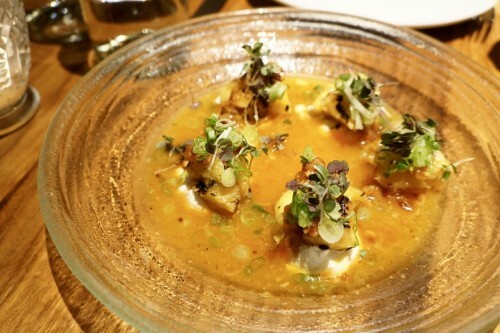 The entrees or “Fire” dishes, which range in price from $17 to $27 includes black cod, scallops and pork belly. There’s also a selection of “Tablas” which are larger entrees meant to serve two people. 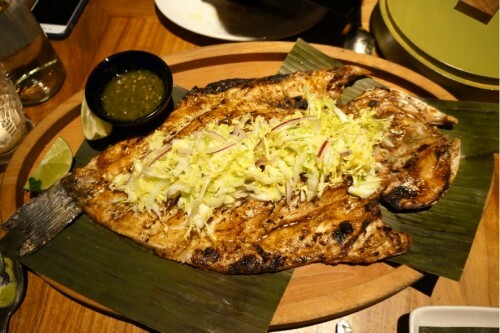 Options include striped bass ($43), chicken a la Leña ($22 half/$40 whole) and the 32oz Tomahawk steak ($90). 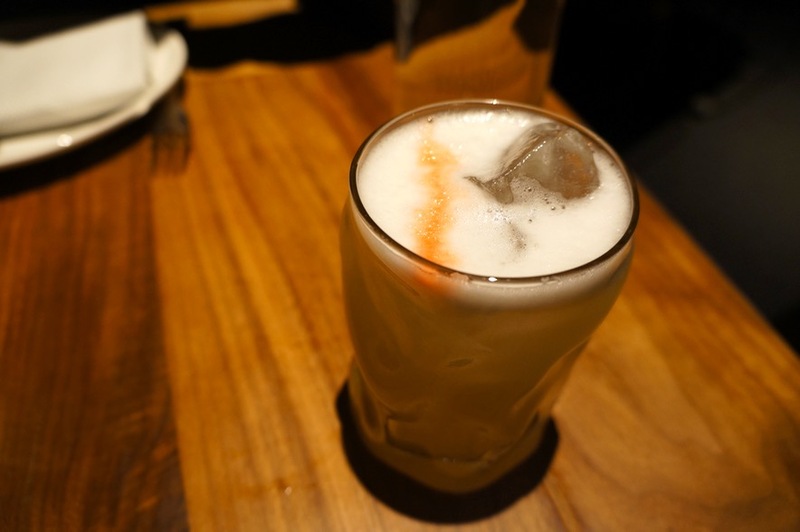 Drink-wise, they have a wide selection of wine including an extensive selection of Mexican wines, as well as an impressive selection of mezcal. We started out with the Pineapple – grill-roasted pineapple, orange lime broth, goat cheese, spicy hazelnut salsa & knob onion tops ($12). This sweet and savoury dish consisted of a combination of flavours that I never would have thought of pairing together. While it definitely leans on the sweet side, it was very well balanced. The goat cheese gave it decadent richness and the hazelnuts added a nice crunch. Highly recommended – unless you don’t care for goat cheese (there’s an abundant amount of goat cheese in it so you’ll definitely notice it). 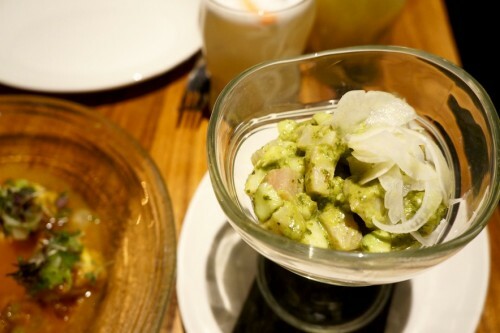 We wanted to order a ceviche and based on a recommendation from our server, we went with the Verde Ceviche – baja hiramasa yellowtail, herby green chile adobo, daikon radish, cucumber, shaved fennel, grilled garlic, chives, creamy avocado ($16). It was a great suggestion! We loved this refreshing and chunky ceviche. I particularly loved the ripe pieces of avocado which gave it a fantastic creaminess. 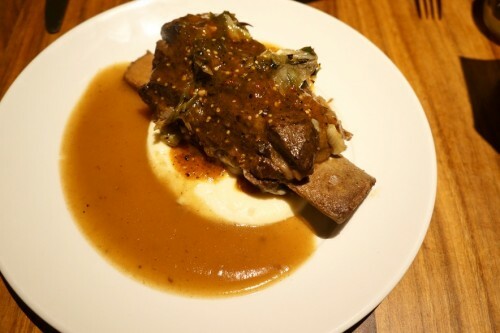 From the ‘Fire’ section of the menu, we ordered the Braised Short Rib – cauliflower mash, Oaxacan pasilla salsa ($24). The shortribs are braised over night to achieve a soft melt-in-your-mouth tenderness. We’ve eaten a ton of shortribs over our lifetime so it’s tough to really impress us with this cut of meat but Leña Brava’s version was a real winner. The Oaxacan pasilla salsa was an explosion of smoky and spicy flavours which paired so nicely with the creamy cauliflower mash (a nice change from potato mash which is often served with short ribs). All entrees come with corn tortillas so you can make your own tacos. From the “Tablas” section of the menu, we ordered the Striped Bass – butterflied Baja Pacifico striped bass grilled with regional Mexican flavours ($43). It was probably an ambitious choice considering we had also ordered the short rib. You have a choice between four flavours: Oaxacan-style a la Talla (red chile adobo glaze), Nayarit-style Zarandeado (roasted garlic, Worcestershire, soy, arbol chile), Yucatecan-style tikin xik (achiote, roasted garlic, spices) and Leña-style herby green chile glaze. We went with the Nayarit-style which was a killer blend of flavours, albeit a touch salty. The striped bass was cooked to perfection – tender, moist and flakey. A must-order! 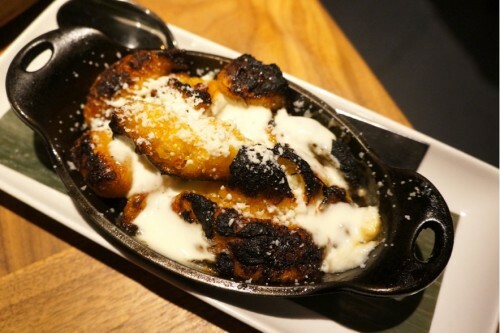 To complement the entrees, Leña Brava offers several sides including kale & poblanos and baby sweet potatoes. The one that caught our eye was the Butter-Roasted Plantains – wood-oven roasted with thick cream and homemade fresh cheese ($8). Since it was made with cream and cheese, it was no doubt rich and decadent but definitely worth the calories. If you didn’t think we had room for dessert, you thought wrong. 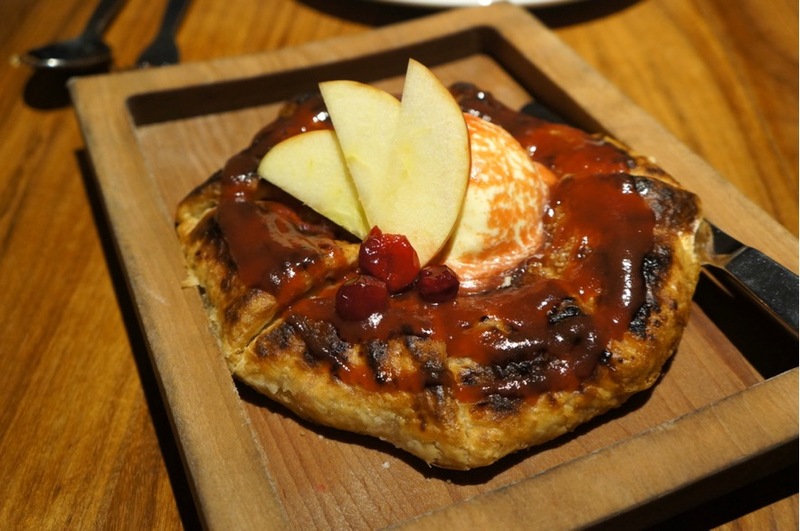 We ordered the Free-Form Wood Oven Tart – flaky pastry filled with apples and spiced cranberry-quince compote, cream cheese ice cream & cranberry caramel ($15) to finish off our meal. The price tag is indicative of the portion size. It’s not meant for one person to tackle on their own. It’s easy for a dessert like this to turn out too sweet but the cream cheese ice cream and tart cranberry-quince compote balanced out the sweetness from the apples and caramel. It was the perfect ending. Leña Brava was the last dinner of our trip and it certainly ended on a high note!